Our Aviation Wall Clocks are a unique modern spin-off of our primary product of WWII Nose Art panels. 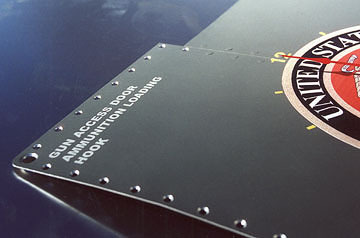 Construction of the clocks are of 3 pieces of aluminum riveted together to form a generic panel from a modern day military aircraft. They have been designed to be an affordable clock with quartz movements that have a distinctive look of classic military hardware. Virtually any aviation related image can be applied to the surface of our clocks to suit your corporate needs.